An emerging group of people with gluten sensitivity have such psychiatric and neurological disorders as schizophrenia, ADHD, depression, and bipolar syndrome. The more we study gluten, the more we learn how antiquated and out dated the current definitions being used to define it are. Less than a year ago, it was thought that celiac disease was the only manifestation of gluten sensitivity. Today this false misconception has been dis-proven in multiple studies, trials, and anecdotally in thousands of people around the world who have gone gluten free and experienced the great benefits to their health. Unfortunately, many doctors and patients diagnosed with celiac disease still cling to these archaic notions. Fortunately, the efforts to raise awareness and education on this matter are paying off. The following excerpt was taken from a recent ABC News story on gluten sensitivity based on interviews with Dr. Fasano and Dr. Peter Green (both of these doctors are leading celiac researchers): ...recognize gluten as an invader and unleash attacks on the small intestine, producing diarrhea, abdominal pain, along with fatigue, headaches<http://www.glutenfreesociety.org/gluten-free-society-blog/headaches-depression-nerve-damage-and-seizures-is-gluten-to-blame/> and joint inflammation<http://www.glutenfreesociety.org/gluten-free-society-blog/arthritis-caused-by-gluten-and-food-allergies/>. 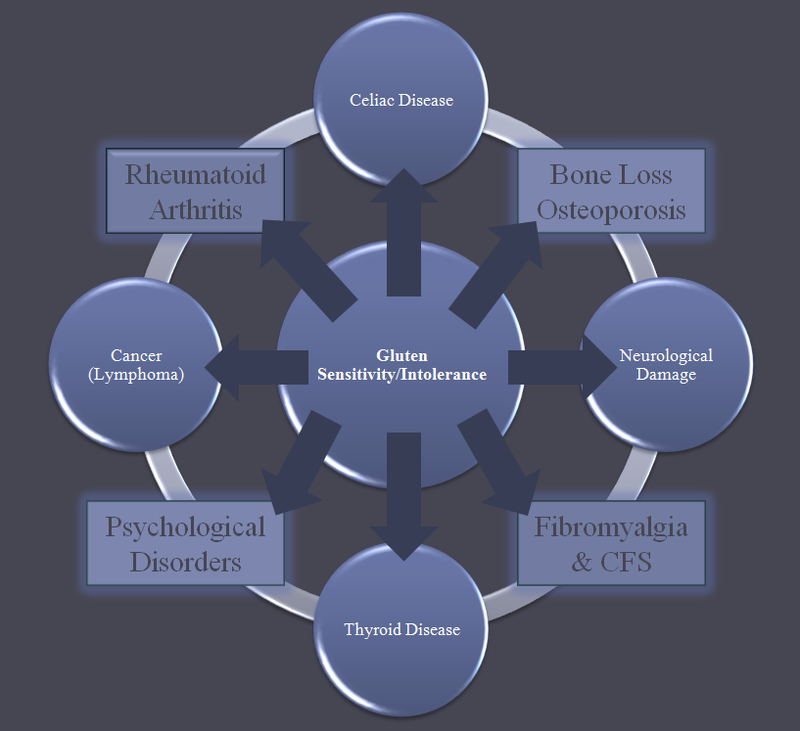 Over time, celiac disease can lead to malnourishment, osteoporosis<http://www.glutenfreesociety.org/gluten-free-society-blog/autoimmunity-gluten-osteoporosis/>,neurological conditions<http://www.glutenfreesociety.org/gluten-free-society-blog/sensory-nerve-pain-resolved-with-a-gluten-free-diet/>, and in rarer cases, infertility<http://www.glutenfreesociety.org/gluten-free-society-blog/gluten-intolerance-causes-infertility/> or cancer. An estimated 3 million Americans, or 1 in 133, have celiac disease (the source of the website name for Shepard's campaign, 1in133.org). However, most of them aren't aware of it, in part because it can strike at any time. Only 200,000 to 220,000 Americans have been diagnosed, said Dr. Alessio Fasano, director of the Center for Celiac Research at the University of Maryland in Baltimore, also a summit sponsor. Gluten disruption of the nervous system can lead to nerve damage, neurological diseases, mental disorders and more. Another 300,000 to 600,000 Americans avoid gluten because of wheat allergy, Fasano estimated. A third group within the growing gluten-free constituency comprises the 18 million to 20 million Americans who Fasano estimated suffer from gluten sensitivity, with pain, fatigue, headaches and brain fog much like that of celiac patients. However, his research has found that although they don't make the same antibodies that define celiac disease, they have an inflammatory reaction to gluten. An emerging group of people with gluten sensitivity have such psychiatric and neurological disorders as schizophrenia, ADHD, depression, and bipolar syndrome, and "a higher rate" of some antibodies, said Dr. Peter H.R. Green, director of the Columbia University Celiac Disease Center in New York, another summit sponsor. Dr. Green was quoted as saying: "Schizophrenia used to be called bread madness"
Gluten sensitivity = more than just celiac disease It wasn't very long ago that both Dr. Green and Dr. Fasano denied the connection between gluten and mental disease. Now both of them are publicly confirming the connection. This is fantastic news! It should be known that Gluten Sensitivity is now re-classified separately from celiac disease. 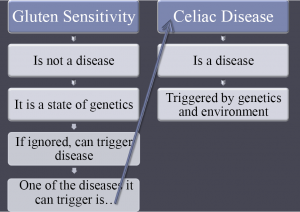 The following diagrams illustrate how one should look at the issue: [http://www.sott.net/image/image/s6/139105/medium/Celiac_vs_gluten_sensitivity_3.png]<http://www.sott.net/image/image/s6/139105/full/Celiac_vs_gluten_sensitivity_3.png> [http://www.sott.net/image/image/s6/139106/large/Gluten_Induced_Disease_Chart.png]<http://www.sott.net/image/image/s6/139106/full/Gluten_Induced_Disease_Chart.png> If you want to learn more on this, watch our Glutenology tutorial here.<http://www.glutenfreesociety.org/video-tutorial/gluten-sensitivity-what-is-it/> Many patients with undiagnosed gluten sensitivity have mental and neurological disorders as a result of gluten exposure. They do not have symptoms associated with the gut. This mainstream admittance that gluten intolerance and brain disruption<http://www.glutenfreesociety.org/gluten-free-society-blog/leaky-brain-seizures-epilepsy-gluten-sensitivity/> are connected will help a lot of people get the proper diagnosis and the help that they need.